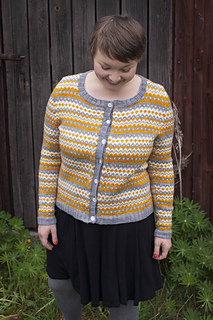 Grey Sparrow is a stranded cardigan knitted from the bottom up in one piece. 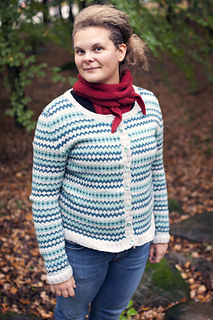 The sleeves are knitted separately and are then joined with the body at underarm and the yoke is worked in a way that imitates the look of a set-in-sleeve. 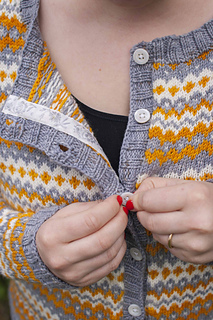 Very little seaming is involved, the only seaming necessary is at the top of the sleeve cap and under the arms. 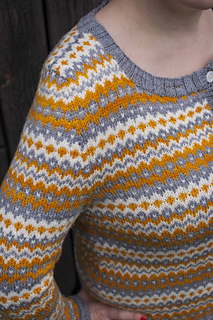 Most of the garment is knitted in the round for simplicity. 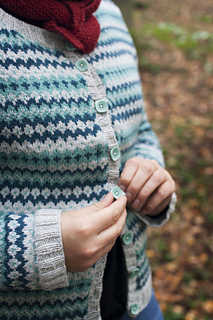 Steeks are cut for the front opening when the cardigan is finished and the button bands are picked up from the steek edges. 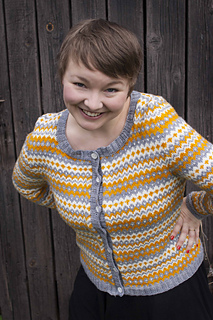 The garment is knitted in the round to the beginning of neckline where you start knitting back and forth. Or any other sport weight yarn with approximately 320m/100g that gives you the right gauge. 28m x 30v = 10 x 10cm in stranded knitting after blocking. 80cm 3mm + 3.5mm circular needles. 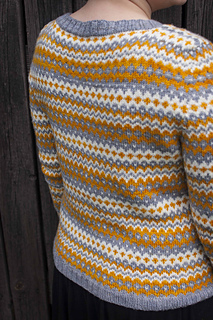 The sleeves are knitted in the round, with circular needles or DPN:s.
Available in Swedish and English.